Leading arched PVC company Force 8 have now introduced arched vertical sliders to their extensive collection of products, using REHAU profile. Force 8 fully fabricate the arched vertical sliders, in their Hazel Grove factory. Adding vertical sliders to their extensive portfolio allows Force 8 to expand on their current knowledge and expertise to extend the number of products that they are selling to the customers. The overall design of the vertical slider features a 35mm meeting rail, giving an authentic look and with other features such as full mechanical joints and run through sash horns, you can expect this to give off a period feature. Due to these added features, even experts can’t tell it apart from a genuine timber sash. As Force 8 have 30 years’ experience, they have heavily invested in the equipment that is needed to create a one-piece bend without the need to weld. 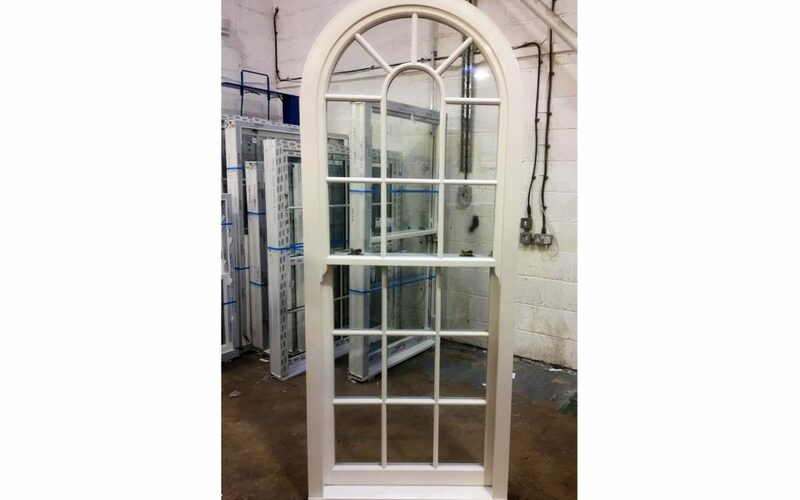 For any trade customer looking to have an arched vertical slider, the smallest arch that Force 8 can manufacture is a 300mm radius and this can still be made with a one-piece bend. “Vertical sliders are one of our premium products and with its grained finish, having to use welds can destroy the overall aesthetics of the design. As we’ve constantly developed our one-piece bending approach, we’ve found a way not to destroy the design”, comments Dennis. Force 8 will focus on manufacturing the arches for the vertical sliders. However, don’t hesitate to send Force 8 your arched vertical slider specification to get fully quoted by the company. To add to the wide range of effects that vertical sliders present, they can be offered in a wide range of effect options, whether that’d be wood grain or a smooth white finish, adding an authentic finish. Vertical sliders can now be offered in all RAL colours that will be sprayed on site by Force 8, ensuring that customers have a wide range of designs available to choose from. During the manufacturing process, when bending the arch, the Georgian bars that feature in the design can also be bent. Force 8 can deliver their products nationwide, so you are never far away from their amazing services and arched composite doors. Remember to obtain your copy of the Force 8 brochure. This is available online or reserve your copy today to see the full range of arched products. Don’t hesitate to contact Force 8 to discuss their vertical sliders.